Today the Borscht Belt, located in the Catskill Mountains of New York, is recalled through the nostalgic lens of summer swims, Saturday night dances, and comedy performances. But its current state, like that of many other formerly glorious regions, is nothing like its earlier status. Forgotten about and exhausted, much of its structural environment has been left to decay. Some of the structures have been lying abandoned for periods ranging from four to twenty years, depending on the specific hotel, or bungalow colony, and the conditions under which it closed. Other sites have since been demolished, or repurposed, documentation of a pivotal era in American Jewish history. From entire expanses of abandoned properties to small lots containing drained swimming pools, the remains of the Borscht Belt era now lie forgotten, overgrown, and vacant. In the absence of human activity, nature has reclaimed the sites, having encroached upon or completely overtaken them. Many of the interiors have been vandalized or marked by paintball players and graffiti artists. Each ruin lies radically altered by the elements and effects of time. Through a photographic series of “now” and “then” imagery composed by using found postcards a mirror image of their present day depictions will be presented. The history of the Borscht Belt, its rise, fall and impact (via archival images and objects) will be shown in a powerpoint presentation. The talk will discuss the research, field-based process, investigations and the layered meanings in the photographs displayed. Marisa Scheinfeld was born in Brooklyn and raised in the Catskills. She received a B.A. from the State University at Albany and a MFA from San Diego State University. Her work is highly motivated by her interest in the ruin, or site and the histories embedded within them. Marisa’s work has been exhibited nationally and internationally and is among the collections of The Center for Jewish History, The National Yiddish Book Center, The Magnes Collection of Jewish Art & Life, The Simon Wiesenthal Center and The Edmund and Nancy K. Dubois Library at the Museum of Photographic Arts. 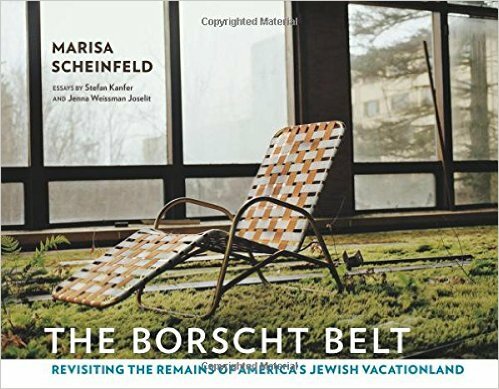 She is the author of The Borscht Belt: Revisiting the Remains of America’s Jewish Vacationland. I was born and raised in Monticello NY. I grew up in a family who owned a large bungalow colony (I am the original ‘owner’s daughter’) and as such had a free knish every day as well as an inside view to a world known only to others like me and to those who rented a bungalow for the summer. My dad built the place from the ground up and he was a business associate and close friend to all of the major hotel owners. There was not a hotel nightclub my parents did not have carte blanche to. I was introduced to comics (the word ‘comedian’ came later). Our parents were big fish in the Catskill pond and while it was exhausting work for the adults, it was a magical time for all the kids. I live in Los Angeles but still spend a good portion of the summer in the ‘mountains’. So that means I am available near NYC late June through the beginning of August. I have not yet read your book but promise to this spring. I would love to meet you at one of your speaking/book signing events. Please share your summer schedule and I will make a plan to show up and introduce myself. Thank you for writing and remembering this wonderful place. I will pass you message on to our speaker. May I ask how someone in Los Angeles became aware of this talk?